Papermilldirect stock a huge range of pink copy paper that’s both high in quality and competitively priced. A popular colour of paper within schools, our pink paper reams are manufactured by Rey Adagio using 80gsm or 160gsm weight paper, and each pack contains either 250 or 500 sheets to meet your particular demand. 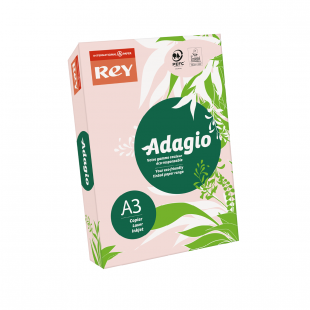 Rey Adagio’s pink paper is created according to eco-friendly principles too, being sourced only from sustainable forests and carrying accreditations that include PEFC™ or FSC®, EU Ecolabel and ISO 9706. As a result, you can bulk-buy from Papermilldirect with confidence. 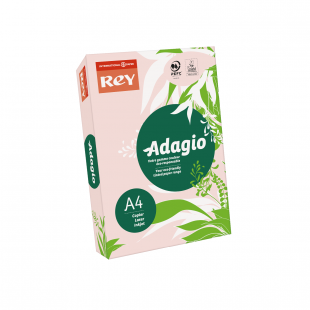 Rey Adagio pink printer paper is specifically made for use alongside inkjet and laser printers, so it’s designed to take the boldest ink pigments and dry as quickly as possible. An acid-free composition and a smooth finish makes this possible, and results in this paper are suitable for end uses that include leaflets, posters, training materials, promotional inserts, brochures, dividers, reports or even school craft projects. The pink tint also serves a functional purpose, as coloured backdrops for text can assist readers who are dyslexic, so there plenty of reasons to keep some in your stock. Papermilldirect takes pride in the quality of our pink paper reams, but we also make sure to make them as accessible as possible. We supply countries across the EU and Scandinavia, but also offer FREE delivery across the UK mainland when you spend more than £60 with us. For business or school owners who require regular supplies of office paper, there’s also our Trade Discounts program, which potentially opens up savings of 40% on bulk paper orders. For only £1, you can take advantage of a sample, letting you decide on the paper that suits you before you commit to a large order. For more information about our pink copy paper options, just give a member of our team a call on Mon – Fri between the hours of 9.30am – 5pm, or make use of our comment box. We’ll be happy to assist with your query.